ATV Parts, ATV Radiator Kits, ATV Wheels Tires, ATV Suspension Springs Shocks Bumpers - Wild Boar ATV Parts > Bumpers > Can-Am Renegade 500/570/800/850/1000 (Gen 2) All Models Metal Aftermarket Floorboards $245.00 FREE SHIPPING! 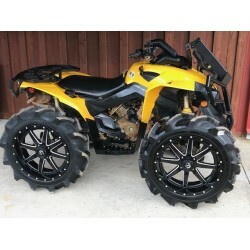 « EFX MotoHavok 34X8.5X18 Big Wheel Kit $1400.00 FREE SHIPPING! Don’t limit yourself to not be able to RUN BIGGER TIRES & GET EXTRA SUPPORT!! Wild Boar ATV Parts has you covered! These Floorboards are hands down the BEST out on the market.You won’t be disappointed! Check Out our NEW WILD BOAR RENEGADE FLOORBOARDS! Now Avaliable for $245.00 FREE SHIPPING! DON’T FORGET to check out our other products that can be purchased for this bike! Renegade Rear Rack, Renegade 800 Stealth Bumper, Renegade 1000 Stealth Bumper, Renegade 1000 Radiator Relocation & Bumper Combo,Renegade 800 Radiator Relocation & Bumper Combo,Renegade XMR Radiator Relocation & Bumper Combo, Renegade 800 Rear Bumper, Renegade 1000 Rear Bumper! Also available WINCHES, LED LIGHTS & much more ACCESSORIES! Here at Wild Boar ATV we know the struggle of wanting to run bigger tires, but maybe the fear of making too many changes stops you from wanting to purchase a lift. These new metal floorboards are the perfect solution. We’re happy to introduce a product that will allow you run 32″ tire with your stock suspension. These floorboards are powder coated flat black for durable, yet sleek look. Foot pegs and hardware are included, no need to cut your stock pegs.